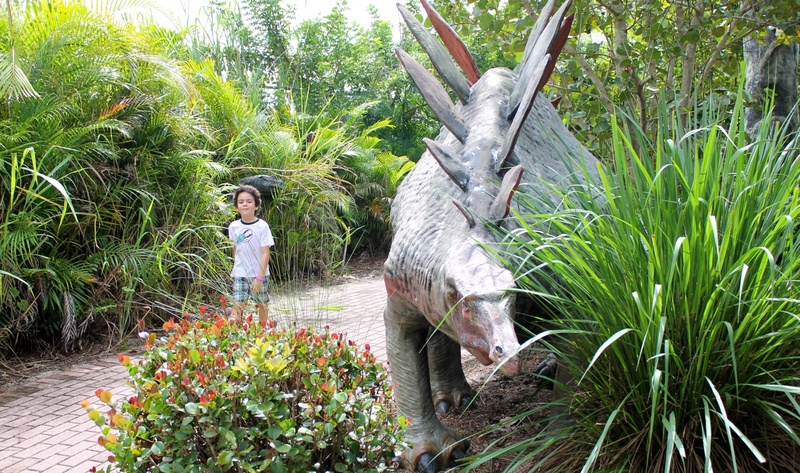 When it comes to Southwest Florida family friendly attractions the Shell Factory & Nature Park has always been a favorite. 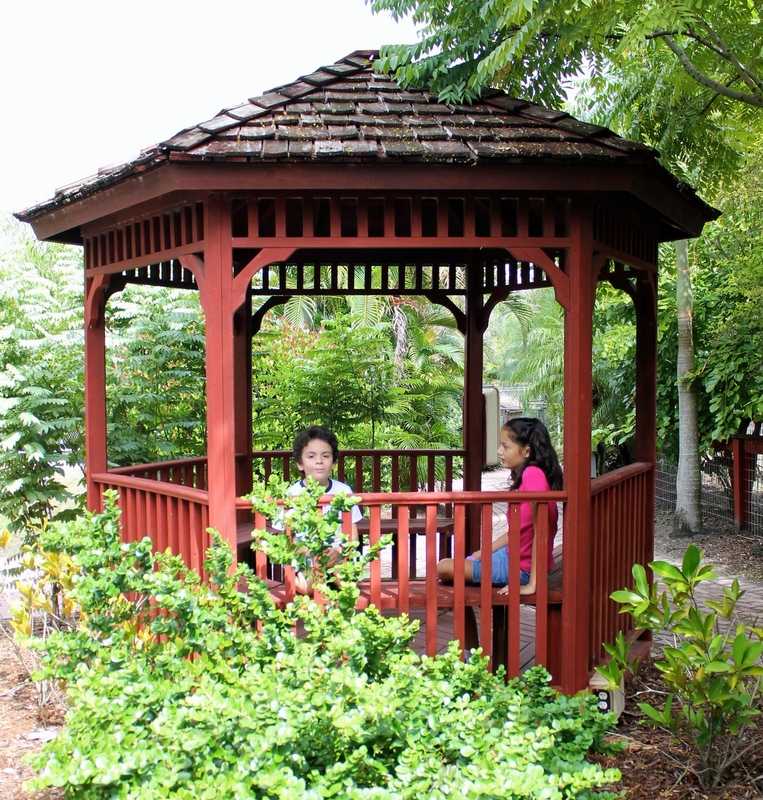 The Shell Factory and Nature Park is one of Florida’s most iconic tourist attractions. 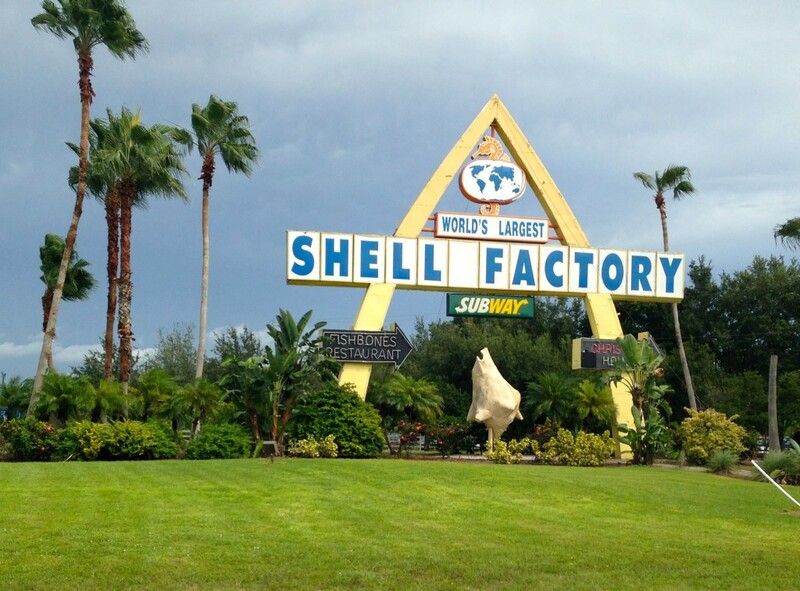 Over its 76 year history (opened in 1938), the Shell Factory has survived numerous challenges to stay in business, from the re-direction of the north-to-south tourist route to bankruptcy and hurricanes. We had been there many times, specially when the kids where younger and when we heard about the new zipline we decided it was time to go back and I am really glad we did. The minute we arrived my son spotted the new Soaring Eagle Zip Line and could not wait to get on. 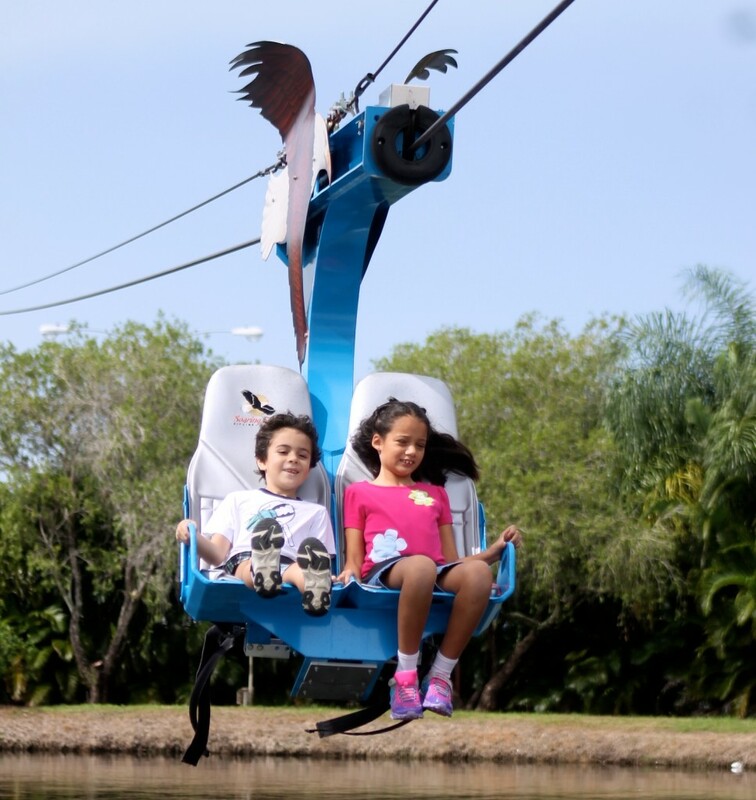 I love that this zip line has two seats where both kids could ride safely. A bit like a ski lift the thrilling ride flies over the lake where the bumper boats are and is ideal for thrill seekers, young and old. We then headed to the Nature Center where we walked along beautiful botanical gardens brimming with local tropical vegetation. 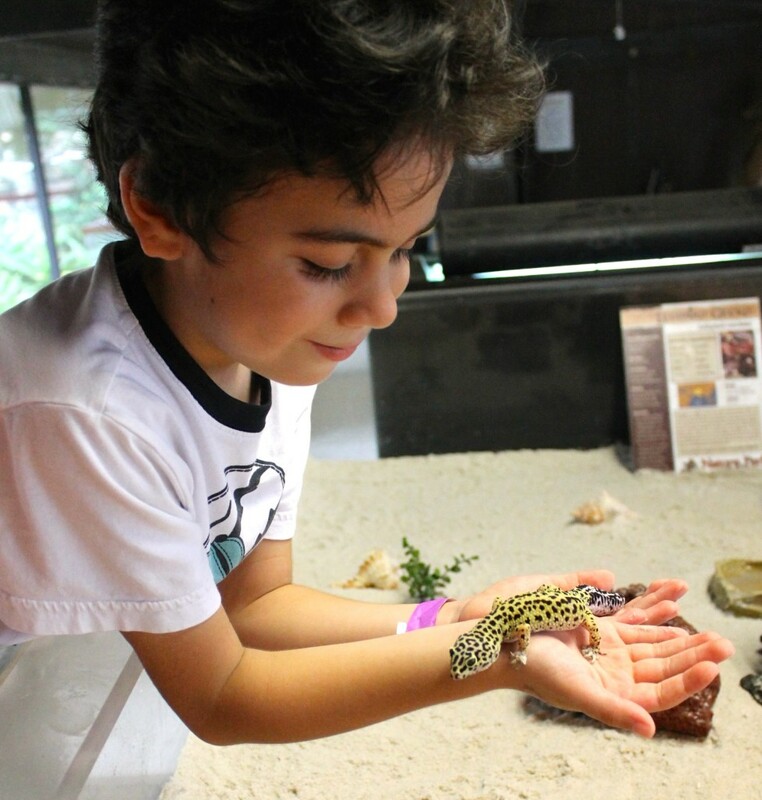 Both of my children love animals and their imaginations where captivated by the mix of native and exotic species, including weird, wonderful and creepy animals like hissing roaches, alligators and other reptiles as well as lemurs, camels and zebras. 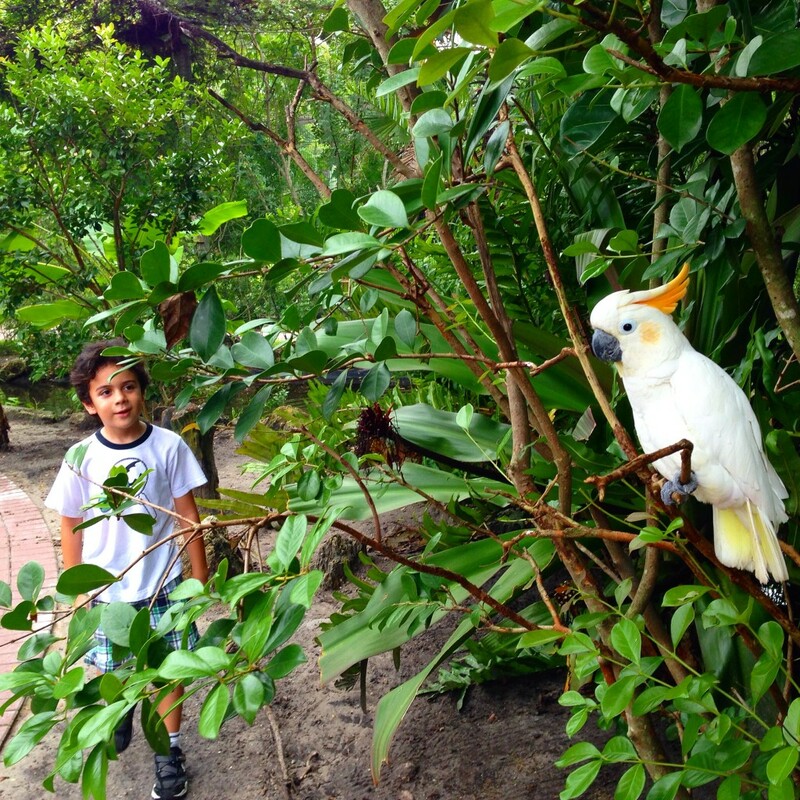 There is a large aviary where tropical birds fly above your head and iguanas roam free. 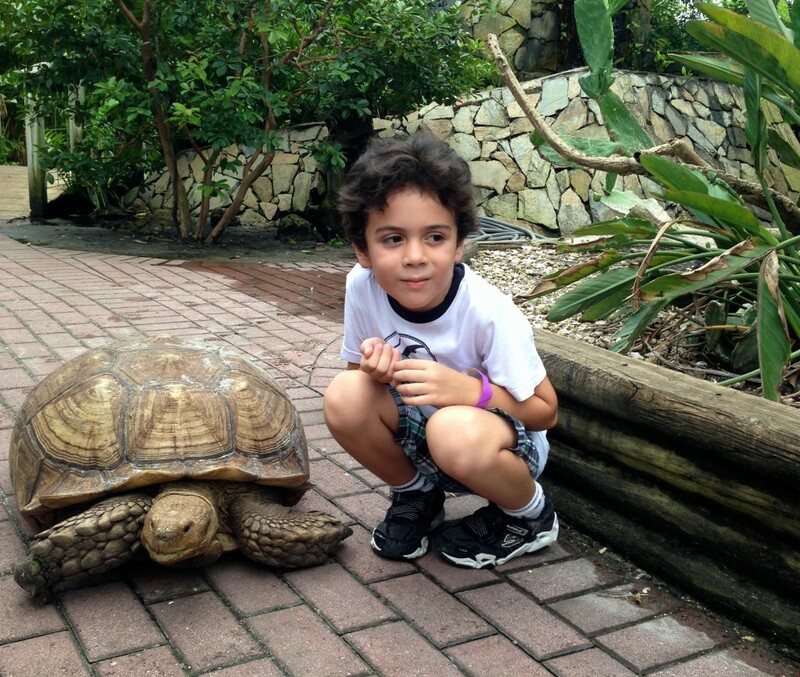 You can feed the turtles and fish in the pond and even pet a huge and friendly tortoise. 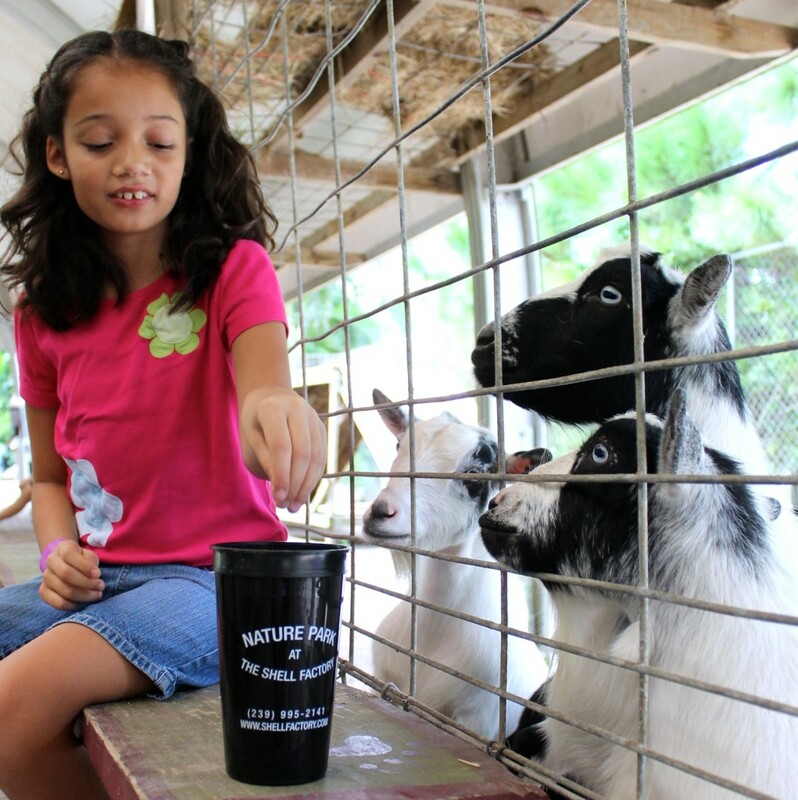 There is also a petting zoo where you can feed and interact with goats and pot bellied pigs. At the Touch Center kids can interact with sea stars, crabs and even handle a gecko or a hedgehog. We all enjoyed a fun filled day as we strolled along the paths watching the animals or just enjoying the beautiful gardens. The Nature Center there is even a section where you can learn all about dinosaurs as you stroll among life sized replicas of these interesting and awe inspiring giants. My little guy just loved getting close to the dinosaurs and even climbing on top of a triceratops or inside a dinosaur egg. 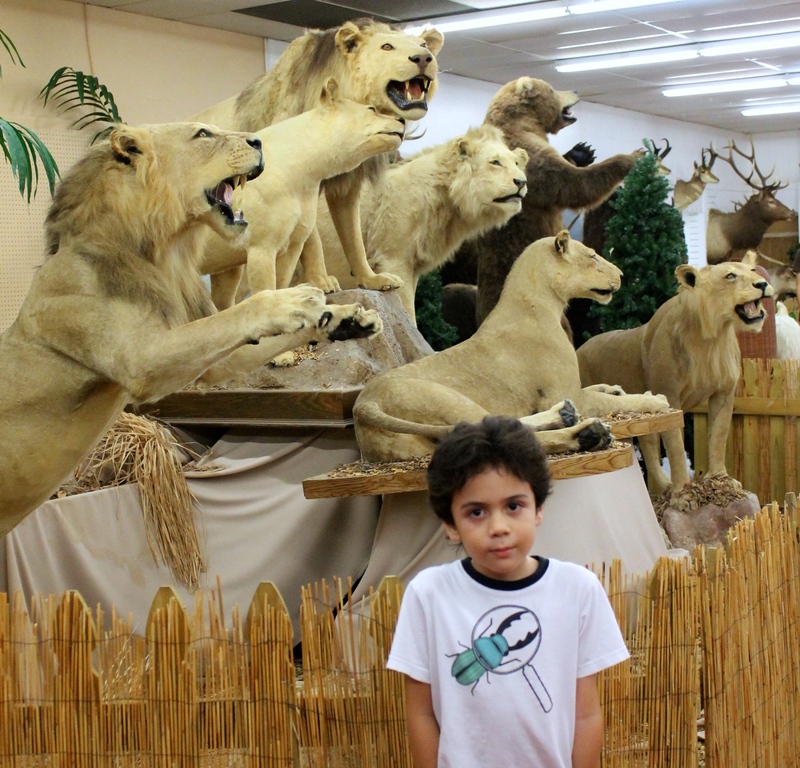 After getting close and personal with the animals at the Nature Center we then headed to the Fun Park where the kids had fun playing mini golf, riding the bumper boats. There are also paddle boats so you can enjoy the lake and burn some energy too. 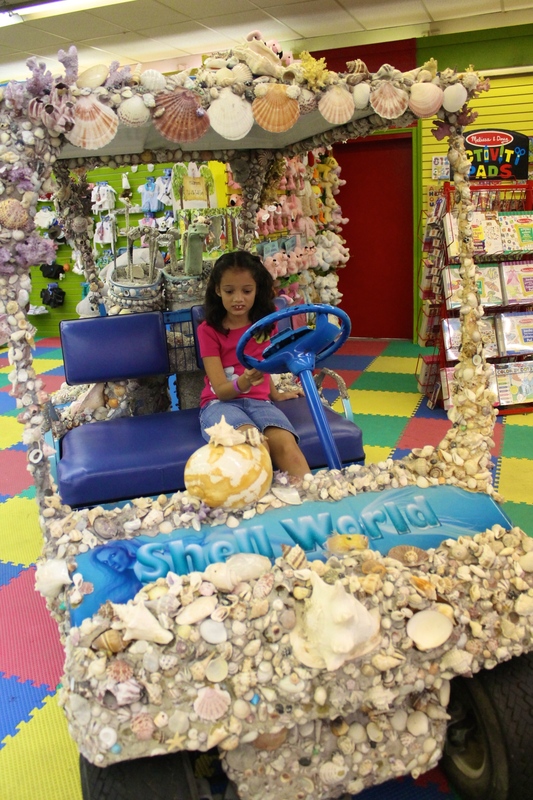 When you visit you can not miss the Shell Factory’s huge store. 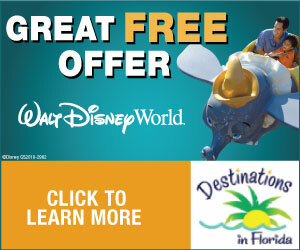 You can take your pick from a wide selection of shells and loads of other stuff available at great prices and this is the place to go to if you are looking for Florida souvenirs for friends and family. 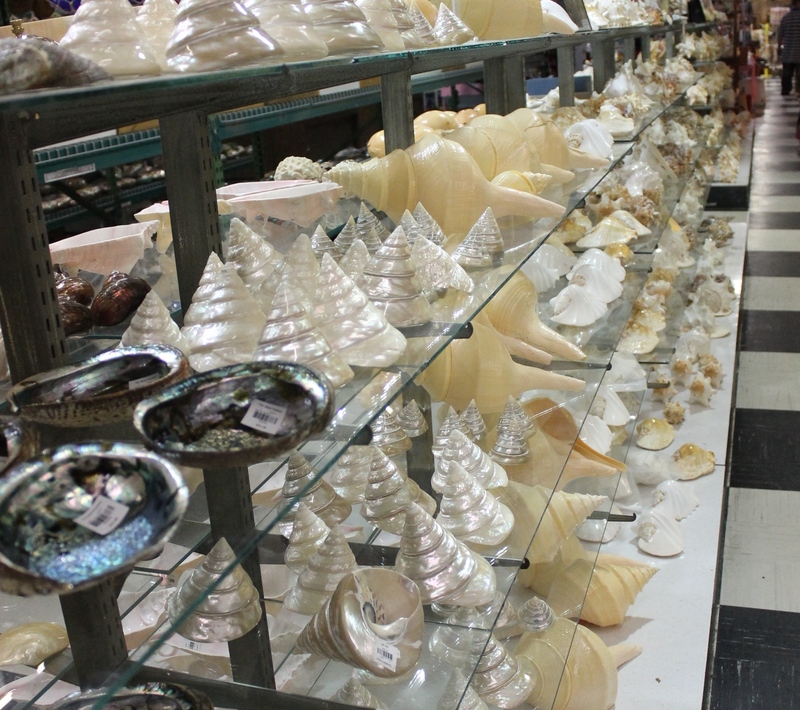 The Shell Factory hosts the world’s largest collection of seashells but there is so much more: from jewelry and fossils to a strange but interesting (and huge!) collection of taxidermy animals, a pirate themed exhibit and even a seashell covered golf cart. There is a lot of history behind the Shell Factory and, specially in the store, you can feel that nostalgia and the gaudy and kitschy nature of the place is part of what makes it so interesting, different and worth visiting. Even if you don’t buy anything visiting the store is an event in itself. And if all the shopping and browsing gives you an appetite then you can indulge at Rosie’s Gourmet Fudge, which I always do. 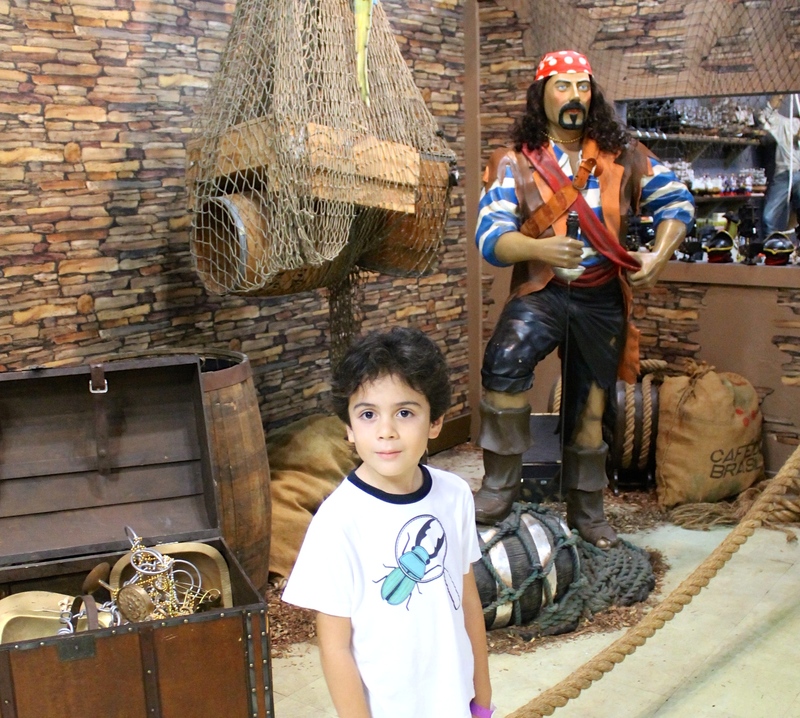 After we where done with our shopping we headed to the Captain Fishbone’s restaurant, a family friendly seafood restaurant that also welcomes four legged guests. The walls of the restaurant are covered with fish replicas and they are also hanging from the ceiling which makes it a very interesting place to eat at, specially for the kids. To learn more visit the Shell Factory website and follow the Shell Factory on Facebook to find out about their latest events. It looks like everyone had tons of fun! My son would love that place. Hello! 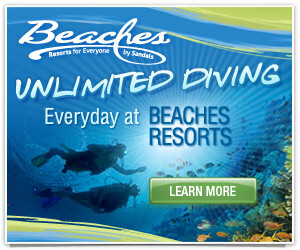 I recently went here and I LOVED it! I noticed you talked about the huge walk in aviary with the tortoises. The white birds (umbrella cockatoos) are SUPER friendly! The other cockatoo with the yellow crest (I believe it’s a citron cockatoo) can be a bit moody but friendly nonetheless. If you see a green bird, it’s safe to assume you shouldn’t handle it. (I got bit by an amazon parrot for intruding in it’s cage, whoops. And the military macaw is just a bit antisocial.) However, you can pet, pick up, and even cuddle the umbrella cockatoos. Most of them love it! I would be careful letting small children handle them though, as some of them don’t realize how sharp their talons are and how strong their beaks are and may unintentionally hurt them. You can even talk to LaLa who will climb on your shoulder and say “lalalalalala” “lala” “lala is a pretty bird” My grandfather even fed Lala and she said “thank you!” 10/10 would go again.